Happy Sunday everyone! I'm just finish with my Hip Hop Abs workout. I focused on Hip, Buns and Thighs. This routine plus the Abs Sculpt works on me to stay fit and get slim since the year 2008. For those who know me, you're probably wondering what happen and I ballooned physically?! Well, the answer is one word - Laziness. And now that I have the motivation and will to trim down my weight, I decided to go back to my old routine of exercise since the last time I went for my OB checkup, I weighed 53 kilos! The last time I went there, I was only 50 kilos. So here I am, working out my lazy bones before they decide to collapse on me for my heavy body. 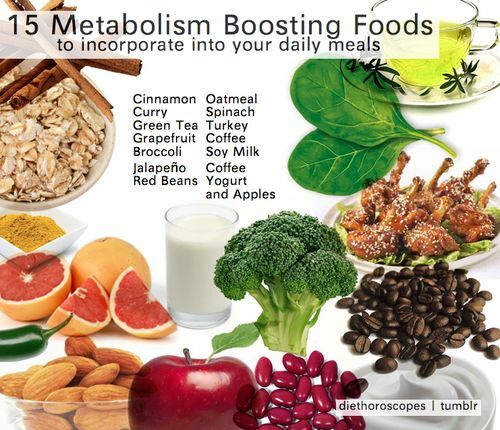 I was checking out the foods listed above and the only ones that I have an easy access to are - Broccoli, Coffee, Spinach, Oatmeal, Yogurt, Soy Milk, Red Beans and Apples. I'm not a fan of anything spicy so definitely Curry and Jalapeno are out of my list. I don't like the taste of Green Tea so I need to cross that out as well. As to Turkey and Grapefruit, I think I have to check out Rustan's Supermarket for this but Turkey is expensive! So I'm sticking with the less expensive foods on the picture. So I'm going to start tomorrow eating Apples, Yogurt, Soy Milk and Coffee. I'm still in limbo about the oatmeal since I read before that the oatmeal that I should be eating to slim down is plain. Not the flavored oatmeal and I love the banana/honey and fruits&nuts variant of oatmeal! As for the red beans, I only eat them if they're in halo-halo. Other than that, I have no idea what dish I need to prepare to include them. Oh, I can use Broccoli for my buttered steamed veggies. That should do the trick. I just hope I can keep up with this plan for the next two months. Good luck to me!